The sun is shining, the weather is beautiful and i’m feeling happy happy!! 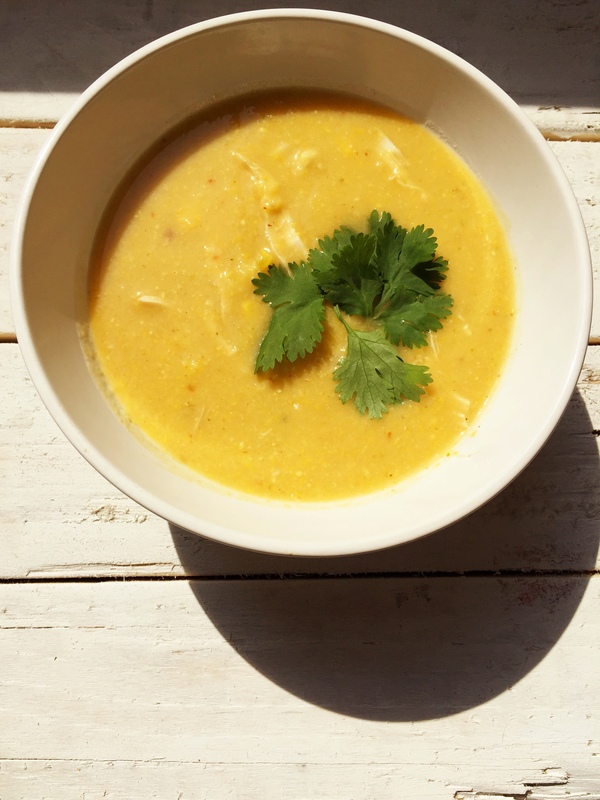 I am making a conscious effort to use up everything in my kitchen and trying to curb my obsession with grocery shopping so i’ve whipped up a beautiful batch of a delicious soup that is so bright, colourful and packed full of flavour that every bowl will make you Happy Happy!! 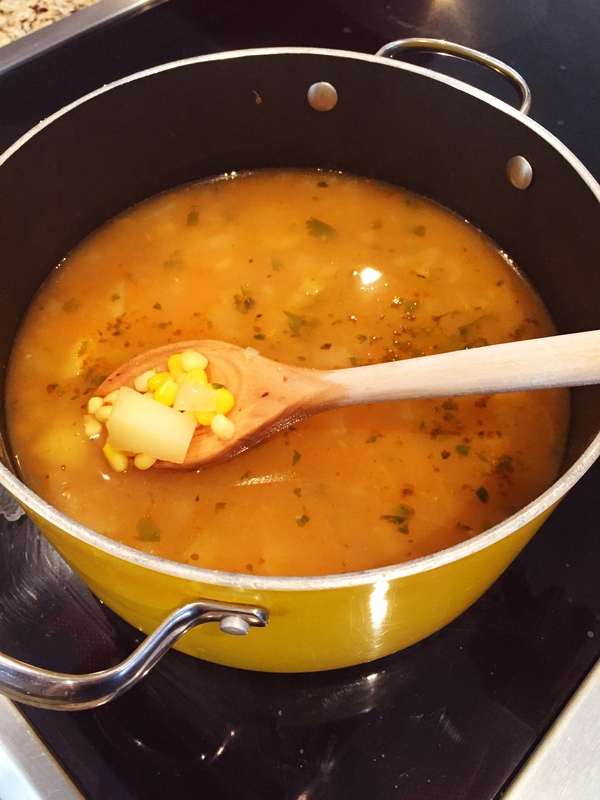 I tend to make a lot of soups in the winter but this soup makes me think of summer because of the corn and the lime juice. 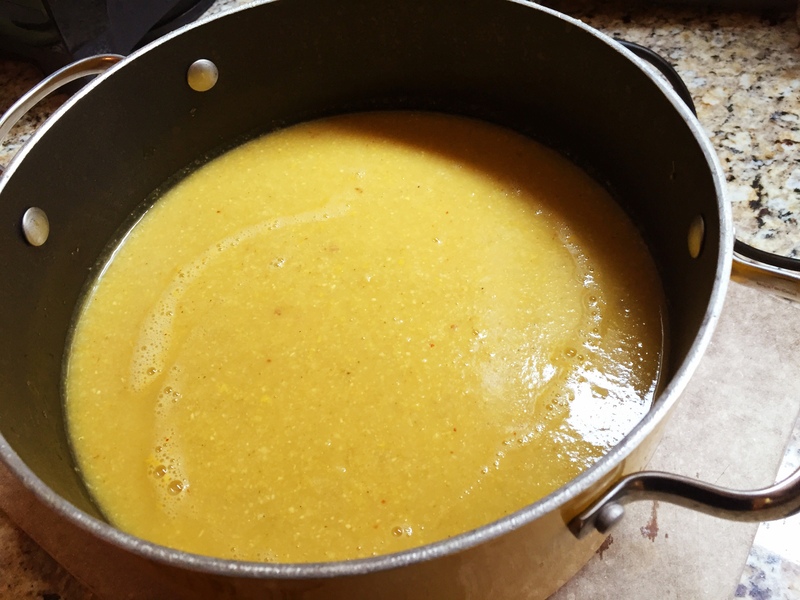 The good news is that this soup can be made in the winter too because it calls for frozen corn niblets (that word always makes me laugh) and you can sub the juice of 1 lime with a bit of store bough lime juice in a bottle and it will still taste like summer in a bowl. Today we are going to use some super simple ingredients that most people have in their pantry. The only somewhat uncommon ingredient is the chipotle puree. It sounds super fancy pants but basically, you just take a can of chipotle peppers in adobo sauce and blend it together until smooth. I store that in a container in my fridge for about 2 weeks or if you don’t think you will use it all in the 2 week period, freeze it in a small ziploc bag and break a piece off whenever you need it. 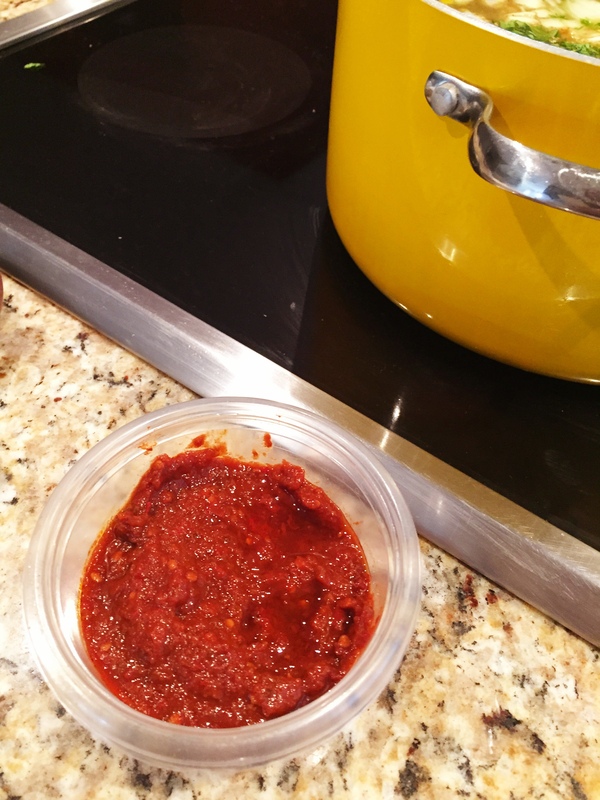 If you don’t have time for that or can’t find a can of chipotle peppers…just use 2 Tbsp of Chilli Powder, Chipotle Powder or Ancho Chilli Powder. All good! Let’s do this shall we? 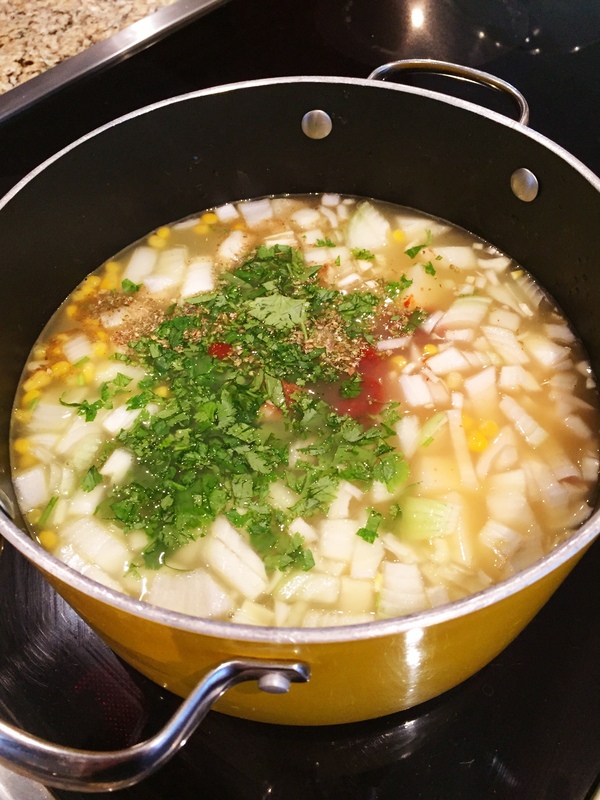 Get out a large soup pot and add your corn, chicken broth, diced potato, onion, chipotle puree, spices and 1/2 of the chopped cilantro. Bring to a boil and then reduce to low heat and let the mixture simmer for 45 minutes to an hour. Here is what the mixture looks like now. All the veggies are soft and completely cooked. Now get out your hand blender and blitz the mixture until completely smooth. Confession, every time I use my hand blender, I always end up singing ‘Smooth Criminal’. *If you don’t have a handblender (seriously, I only use mine for soups because its sooooo super easy and I don’t like transferring the liquid to a blender cuz i’m lazy like that), go ahead and ladle the mixture in to a blender a few cups at a time and puree. 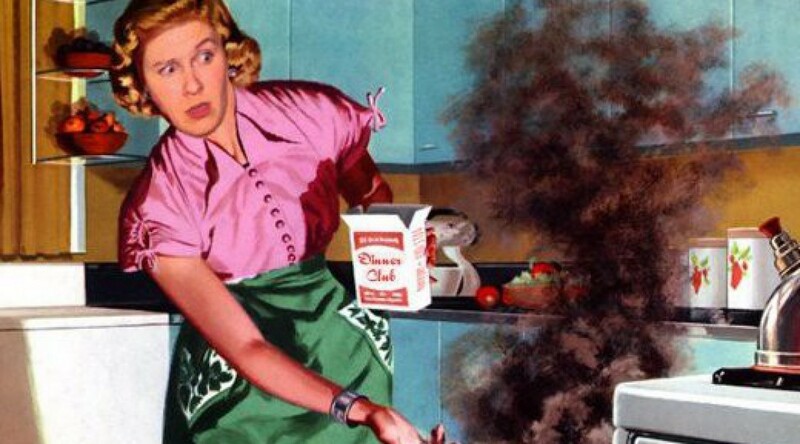 Just be careful…cuz that stuff is hot and please for the love of pearl don’t put too much liquid in at a time or it will blow the top off your blender which means crazy mess!! 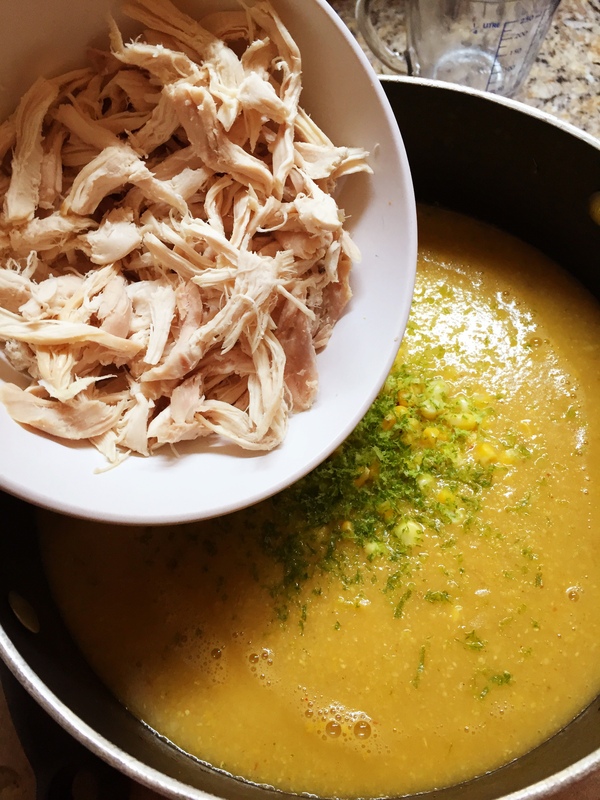 Now that the soup is blended and smooth, you want to add the remaining 1 cup of corn niblets (hee hee), your shredded chicken (i used left over rotisserie chicken…those bad boys save my life), lime zest and a splash of half n half cream (or milk), stir together and let it cook for another 5-10 minutes. I often add about a cup of cooked black beans to this but I didn’t have any on hand so in the spirit of keeping things real and using what I have in the pantry…I made the soup without. 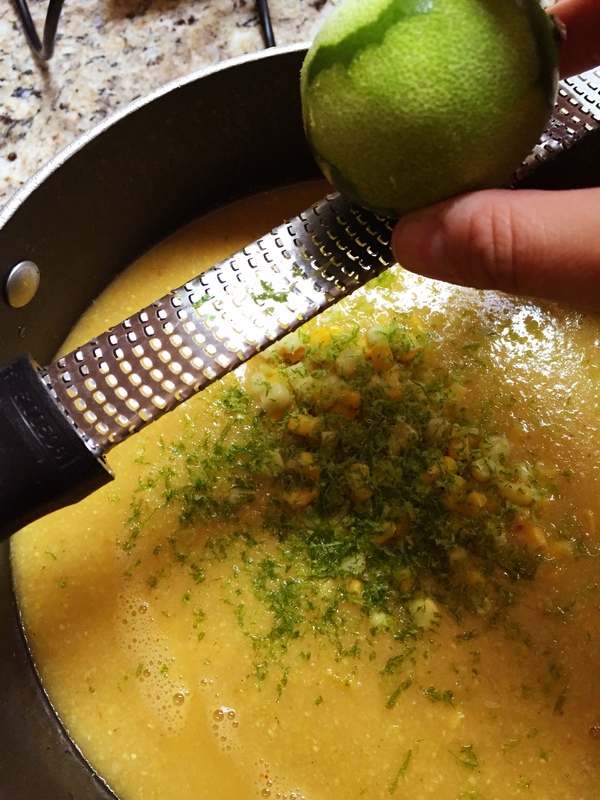 Lastly, squeeze the juice of the lime directly in to the pot. You won’t even believe what this does to the flavour profile…it is amazing!!! Stir it up and you are ready to serve. If you want to get fancy, garnish your bowls with chopped cilantro, Avocado, Cheese, Green Onion or some Sour Cream, totally your call!! Hope you enjoy this deliciousness!! 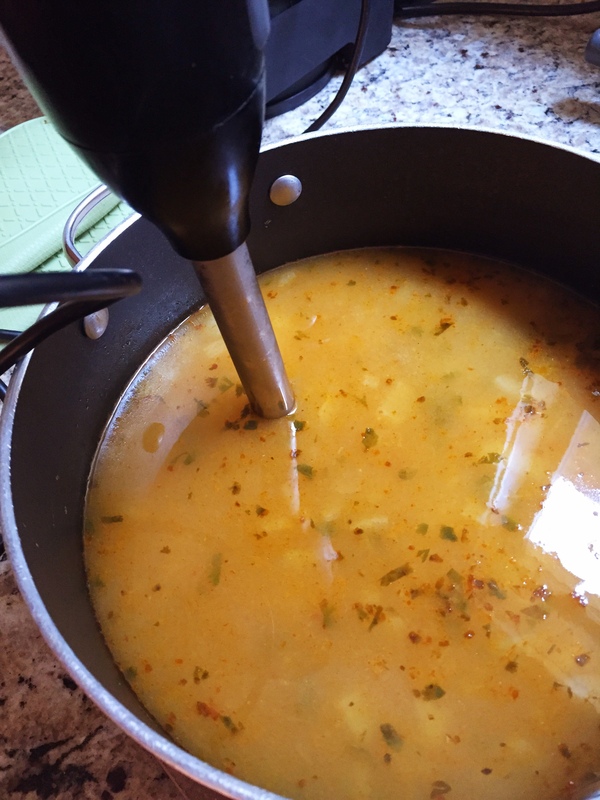 Using a hand blender, blend the mixture directly in the pot until smooth. 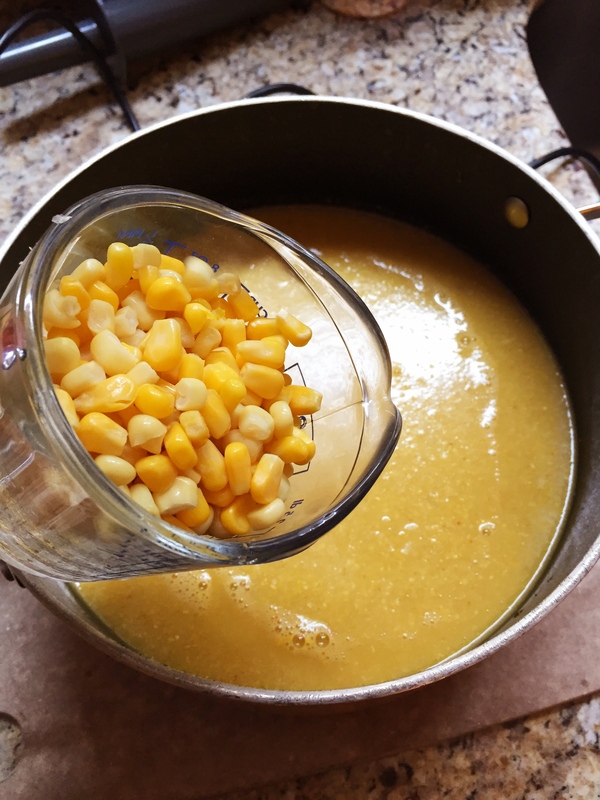 Add the remaining cup of corn, chicken, lime zest, half and half. Stir and let cook for 5-10 minutes. Next squeeze the lime juice in to the soup and stir. *if adding black beans, add at this stage. Serve in bowls and then garnish with whatever you desire, remaining chopped cilantro, sour cream, cheese, chopped tomatoes…totally your call. I hope this soup brings you sunshine, happiness and a very satisfied tummy!! !